Toll-like receptors (TLRs) are one of the key receptor families forming an initial line of defence against invading pathogens. They are pattern recognition receptors (PRRs) along with the mannose (CD206), NOD, and NALP receptors. Like other PRRs, they are germline encoded, functioning to recognize and eliminate microbial non-self antigens. TLRs are widely expressed in the immune system and work cooperatively with associated proteins to generate diverse signaling responses as part of the innate immune response. 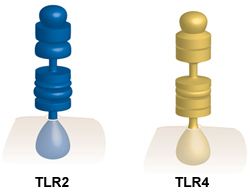 With regard to structure, TLRs are type I transmembrane receptors displaying leucine rich repeats (LRRs), and are located either on the cell surface (TLRs 1, 2, 4, 5, and 6) or in endosomal vesicles (TLRs 3, 7, 8, and 9). The intracellular segment is highly homologous to the interleukin -1 (IL-1) receptor family and is termed the Toll/IL-1 receptor (TIR) domain. TIR domains are conserved across all TLRs and interact with TIR-containing adaptors, such as: myeloid differentiation primary response protein 88 (MyD88), TIR domain-containing adapter protein (TIRAP), TIR domain-containing adapter inducing IFN-beta (TRIF), and TRIF-related adapter molecule (TRAM). TLR2 (CD282) is expressed on a wide range of cell types, including: monocytes, macrophages, myeloid derived dendritic cells, and microglia. It is able to recognize a multitude of bacterial lipoproteins by forming heterodimers with TLR1 and TLR6, and cooperating with CD14, CD36, and Dectin-1. TLR4 (CD284) is primarily known for binding lipopolysacaride (LPS). It is also expressed on a range of cell types, including dendritic cells, neutrophils, mast cells, and B cells. Its role in the recognition of LPS involves several collaborating proteins, such as LPS-binding protein (LBP), CD14, and MD2. Bio-Rad offers a variety of monoclonal antibodies against TL2 and TL4 as shown in the table below. In addition, polyclonals and a wide variety of other TLR specificities are available. Abreu, M.T., Fukata, M., and Arditi, M. (2005) TLR signaling in the gut in health and disease. Akashi, S. et al. (2003) Lipopolysaccharide interaction with cell surface toll-like receptor 4-MD-2: Higher affinity than that with MD-2 or CD14. Beutler, B.A. (2009) TLRs and innate immunity. Flo, T. H. et al. (2001) Differential expression of toll-like receptor 2 in human cells. J. Leukoc. Biol. 69: 474 ?- 481. Kawahara, T. et al. (2001) Type I Helicobacter pylori lipopolysaccharide stimulates toll-like receptor 4 and activates mitogen oxidase 1 in gastric pit cells. Infect. Immun. 69: 4382 - 4839. Kawai, T. and Akira, S. (2006) TLR signaling. Sandor, F. et al. (2003) Importance of extra- and intracellular domains of TLR1 and TLR2 in NFkB signalling. J. Cell. Biol. 162:1099 – 1110. Takeda, K. and Akira, S. (2005) Toll-like receptors in innate immunity. Triantafilou, M. et al. (2002) Mediators of innate immune recognition of bacteria concentrate in lipid rafts and facilitate lipopolysaccharide-induced cell activation. J. Cell Sci. 115: 2603 - 2611. Yang, S. et al. (2001) Synergistic effect of muramyldipeptide with lipopolysaccharide or lipoteichoic acid to induce inflammatory cytokines in human monocytic cells in culture.